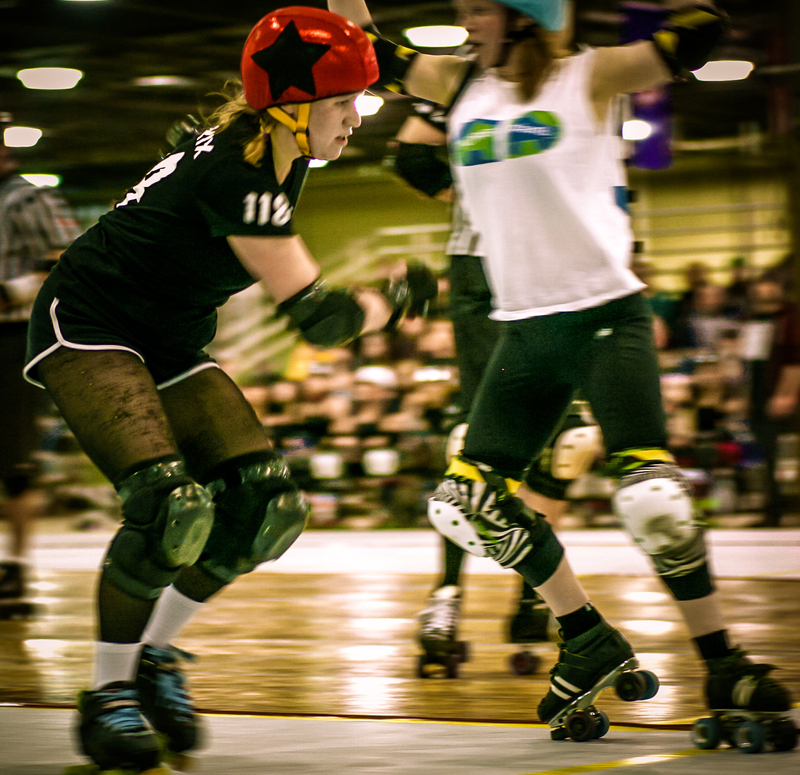 As a lead-in to the weekend ahead, Forest City correspondent Jen Wilson in the guise of jenr8.com brings her derby savvy and keen photographic insights from the January doubleheader. he night started out with a battle royale between the Luscious Lunch Ladies and the Thames Fatales. These two London teams are full of new players so it was a great game to pit the raw power of each new lineup against the other. One major change was that Mighty Thor [ed.note: noooooo!] is now gone from the roster and Torque E Mada has migrated from the Thames to the Lunch Ladies. Going through six years of existence, maybe it was time for another shake-up in the league. The Lunch Ladies gained a lead at the beginning. With Clawberry Shortcake and Kindree Surprise doing most of the jamming for the Thames, the Lunch Ladies had to work that much harder to stay ahead. 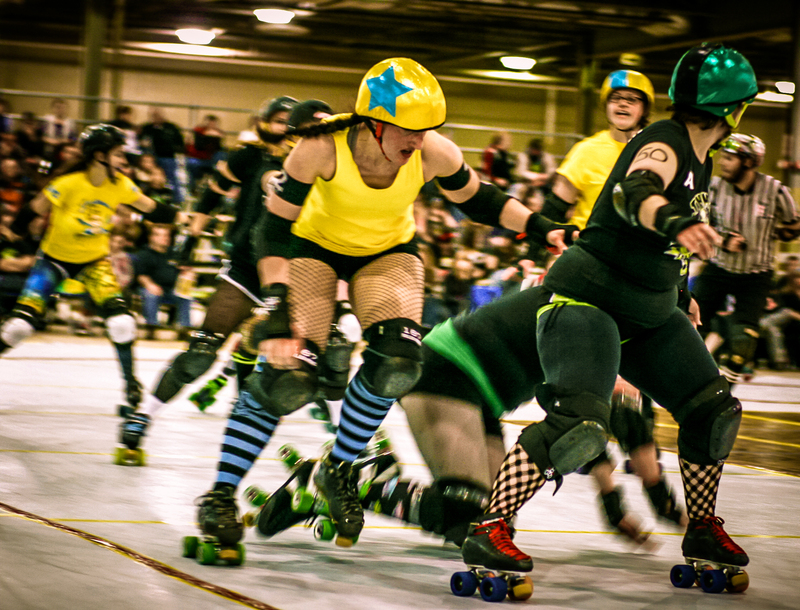 Torque E Mada was playing cat and mouse with the Thames Fatales, and Boxkick Betty had a hell of a comeback for the Lunch Ladies after being in healing mode for the better part of the year. Captain Anne Tastic along with Kilary Tough, Spock Blocker Chelsea Swagger on the Lunch Ladies were forces to be reckoned with. Sewciopath was a monster on the track and was cut from the game during half time for a major misconduct. There was a lot of action in the sin bin to be sure, but the game was generally good-natured. The Lunch Ladies held their lead through the game and won 218 to 119. Lots of action and good plays by both teams, and kudos to all the new players. All of this was leading up to the second game. London’s new travel team was being unveiled to play the TCRD Plan B travel team. The excitement was palpable. I thought that this might be the only home game they would play so it was epic just to be there. 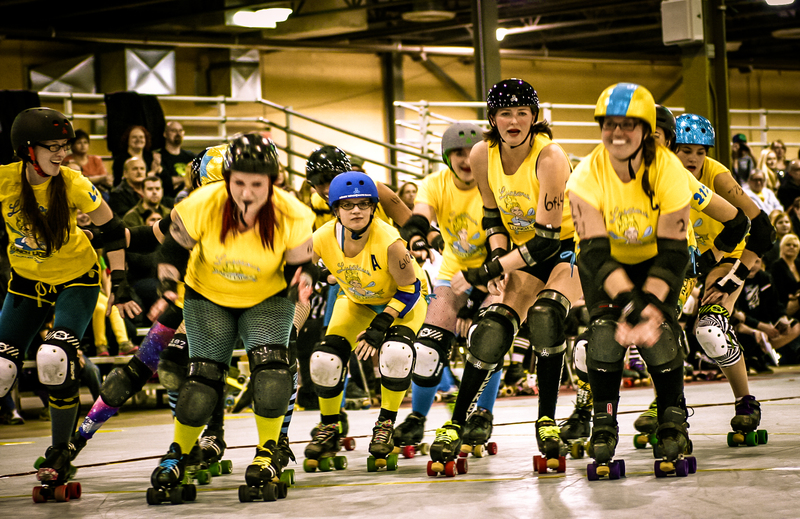 Many great players from both London teams have joined together to become the … Timber Rollers! They were pumped, and watching Plan B practice before the game gave promise to a good match. Newly anointed Timber Rollers Captain LB Cakes [Tracy Regan-Moss] of the Timber Rollers was psyched up for their inaugural bout. Plan B had the lead in the first quarter with the Hellcat of Panar [freshly moved over from Royal City] jamming like a firecracker. The score was 58 to 37 and LB Cakes was jamming hard trying to keep up. However, Tri-City’s luck didn’t last. With Bloodlust Barbie power jamming with 12 minutes left in the first half, she brought the score up to 56 vs Plan B’s 67. Pixie Kix then knocked the score up to 71 and Pepe le Punch added 3 more to that. The score was teetering on the brink though, with Hellcat power jamming to bring Tri-city up to 92 and Fox Smolder blocking mercilessly. 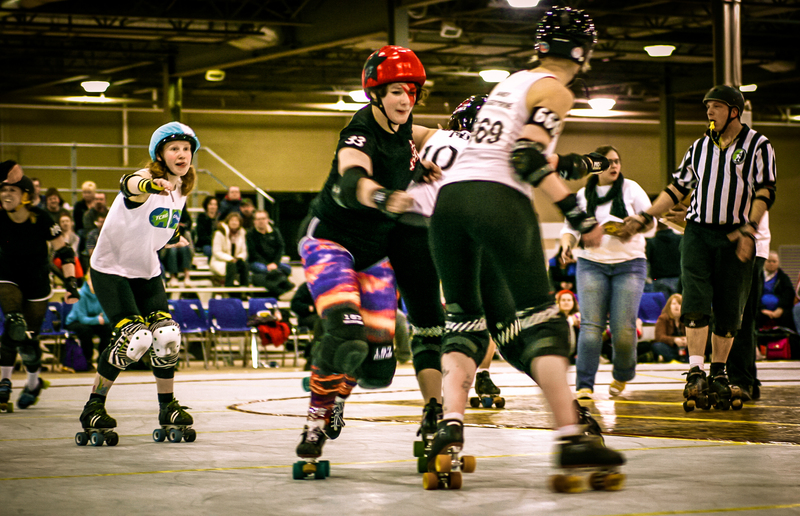 Just before half time, Pepe le Punch and Bloodlust Barbi had power jams bringing the Timber Rollers to 137 vs. 99. The second half started with Bloodlust Barbie pushing the score up to 141. Pepe le Punch ended up in the sin bin giving Tri-City a power jam, but veteran Anya Face’s solid blocking defended the Timber Roller’s lead. Pepe added another 14 points while LB Cakes brutalized Plan B’s jammer. Bloodlust Barbie seemed to be power jamming a lot and could slide by Tri-City’s defenses at will. 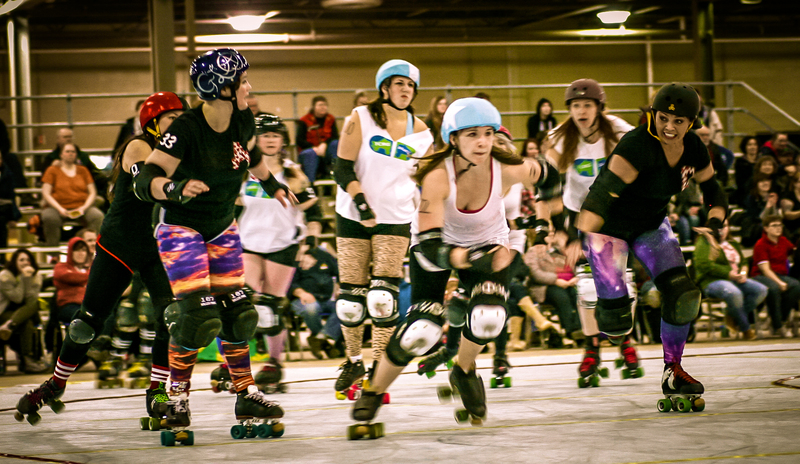 Despite Hellcat of Panar powerjamming too —and she is no small talent — Tri-City just couldn’t catch up. 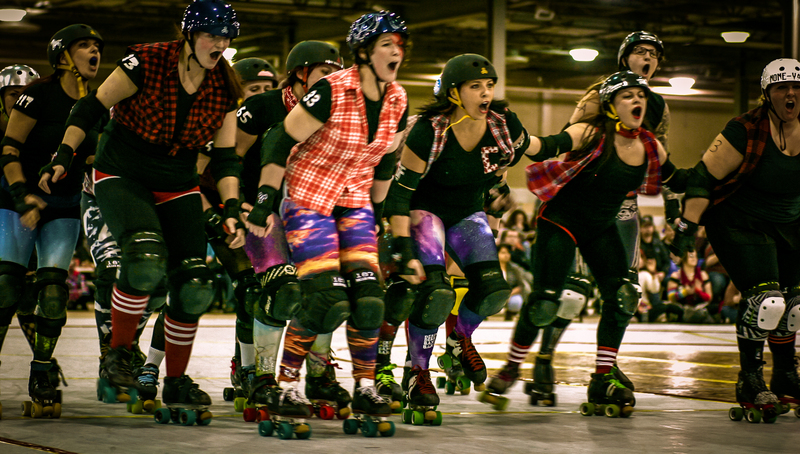 The final power jam was by Glamarchist who brought the final score up to 222 for the Timber Rollers over Plan B at 181. Great playing from everyone! To the Timber Rollers!!! 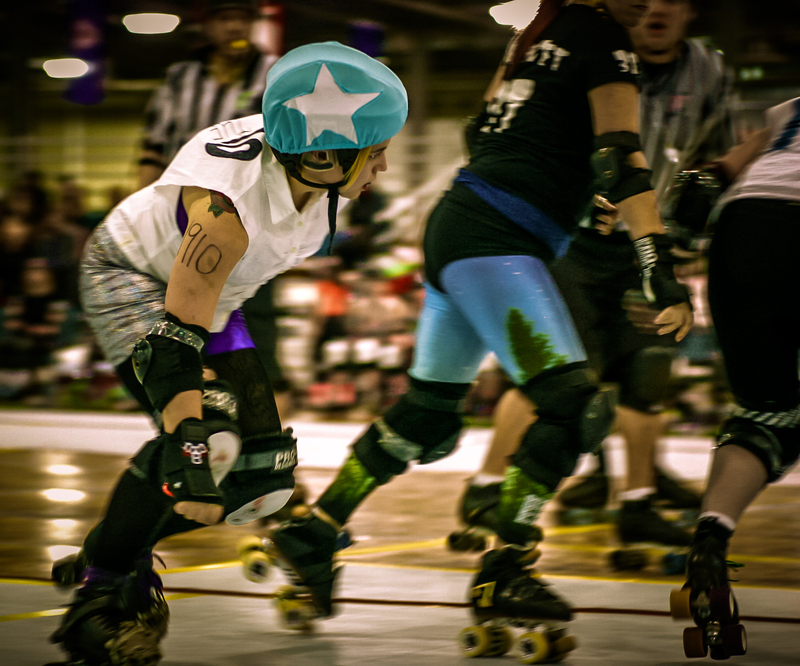 Derby is awesome, taking photos of derby is awesome, and this night reminded me of how good it can be. Boojah!